The U.S. Army Heritage and Education Center contracted with B.R. 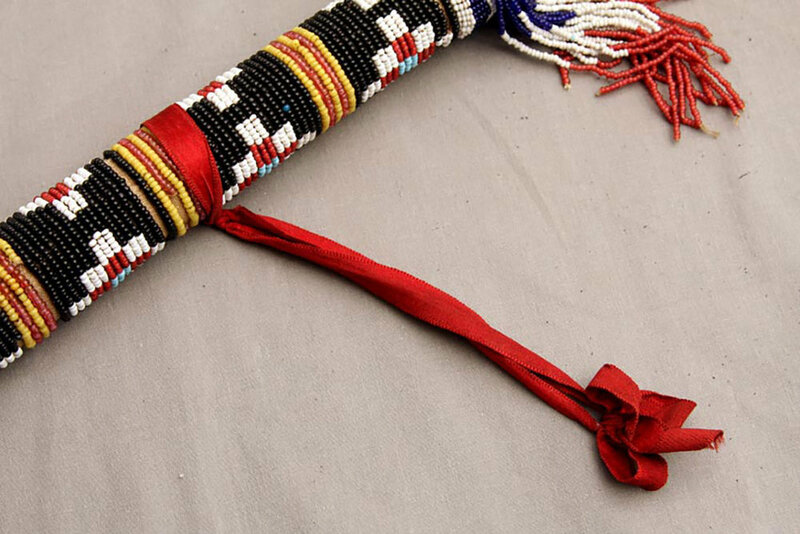 Howard to conserve a bead and cloth covered cane that was collected or purchased by U.S. Military personnel in the late 19th century. It was a typical example of many Native American artifacts produced during that period. This cane was a blend of traditional materials and design incorporated into European objects for trade. An archival quality box was fabricated to hold the beaded cane for transport from AHEC to the studios of B.R. Howard & Associates. The cane was photo documented and written documentation completed. All of the glass beads were surface cleaned. The red textile ribbon was humidified and reshaped. Loose and broken threads were knotted where possible. Loose and detached beads were then secured with a paraloid resin. Missing beads were strung using cotton thread to match the corresponding beadwork. The Bailey Beaded Cane was then transported back to the Army Heritage and Education Center.